What the heck is going on with Mother Nature these days? Within the last six months, I’ve been inundated with tales of horror that used to only be the stuff of “Animals Gone Wild” on Animal Planet. Regular readers of this site may recall the post, Close Encounters Of The Rabid Kind, (published 10/23/2011) in which my son, Mike, related his terrifying experience with a rabid bat along the Gold Coast of Chicago. In that blog, I shared Mike’s history of scary animal moments dating back many years to his first up-close and personal hissing by a goose, when, one day, I thought it would be nice to bring my young children for a walk along the Fox River and feed the ducks. And it was, until the geese began to follow us, demanding the bread we’d brought for the friendly ducks. Warning my children to ignore the geese and walk away from them, one boldly walked right up to Mike, stretched his long neck until he was very nearly at face level and hauled off with the scariest hiss I’d ever heard. Poor Mike – you regulars know that that has become Mike’s name because of my penchant for signing him up for every possible sport, camp, music lesson, and scouting (for which my husband and I will never be forgiven) and wouldn’t let him quit anything because, ‘You don’t want to be a quitter’, which was all Mike desperately wanted. But I digress… Anyway, Poor Mike was indeed scarred from that experience. Then a few years ago, a friend related a similarly frightening story, although, the visual he provided was pretty hilarious. He and his wife brought their two young children to a local restaurant for dinner one warm summer evening and, afterward, decided to walk the scenic grounds. The restaurant overlooked a pond with swans and was quite picturesque. While strolling the path, a swan waddled up to his daughter and started behaving aggressively, squawking at her and pecking at her legs. She naturally became frightened and began to cry and swat at the bird. Her dad tried to shoo the swan away, but that only aggravated the situation. He, then, picked up a large stick and began poking at it, adding fuel to the fire. What started out as an enjoyable evening ended with him beating the swan in full view of the horrified patrons of the restaurant. They managed to escaped, unscathed, but now the whole family hates swans. Understandable. While it’s true that those stories were from years ago, and were all but forgotten, just last fall, Poor Mike texted me that he’d had another encounter with a hissing animal. This time, it was a bat lying on the ground along Chicago’s beautiful lakefront. At first, he thought it was a discarded, crumpled paper bag. Upon passing, though, it raised its head, bared its fangs and hissed. Mike may or may not have let out a little girl scream (that’s still being debated), but he’s pretty sure his heart skipped about a million beats. Later, on the evening news, he heard rabid bats had been reported to be seen along the lakefront. Shortly after that experience, he and his fiance were hiking through a forest preserve in Wisconsin when a leaf blew across Mike’s path. He screamed. Laura laughed. Poor Mike. He lives and works downtown, so his commute is usually a nice walk among the bustling crowds. Except for the times when he’s been pooped on by birds on his way to work. As gross as that sounds, we all know someone (or maybe yourself) that that has happened to. Definitely not a good way to start the day. But, about two weeks ago, again I received a harrowing text recounting yet another horrifying moment. Walking home from work, he witnessed a gull swoop down and attack a bird who was just minding his own business on the sidewalk. What followed was rather gruesome. The gull proceeded to tear the bird apart and appeared to be eating it while it was still alive and fighting for its life. Forget about crime in the streets. Mike is terrified of the winged animals. But, I saw something this morning that was pretty crazy should be filed under the “Mother Nature Is Truly Horrifying.” Opening the sliding door in my kitchen, I happened to look up into the track of the door and saw what I thought was a wasp. But there was something different about it. Quickly closing the door, I peered closely from the safety of the other side. To my shock, it was a big, black spider – Brian claims it was a tarantula, but I’m thinking probably not. It was EATING A WASP. Yes, you read that right. The wasp was hanging out of the spider’s mouth. Brian took a picture of it and I kindly decided to share it on this website. Your welcome. I thought it would be funny to send the picture to Mike’s cell phone, but then I thought it might freak him out for the rest of the day. And, Brian, Peter and I all had a good laugh at Mike’s expense picturing him letting out a scream upon seeing it, and then having to explain himself to his co-workers. We decided in the end to spare him. But, it did remind Brian to ask if I’d heard about what happened yesterday. “No, what happened?” “Mike got pooed on again when he was jogging.” Oh, the inhumanity. Poor Mike. You smashed it, right? The eight-legger? Or sprayed it with chemicals? There’s nothing more grotesque than a well-fed spider. God, I hate them. And those people who say “Spiders are good, they kill other pests” are idiots. Hmmm…this is awkward. No, we did not kill it because I was pretty fascinated by the whole barbaric scene. I figured the wasp was already dead, so where was the harm? Is that bad? I figured he’d be there for a long time digesting his meal, and we could get him later, but little later on, we noticed he was gone! 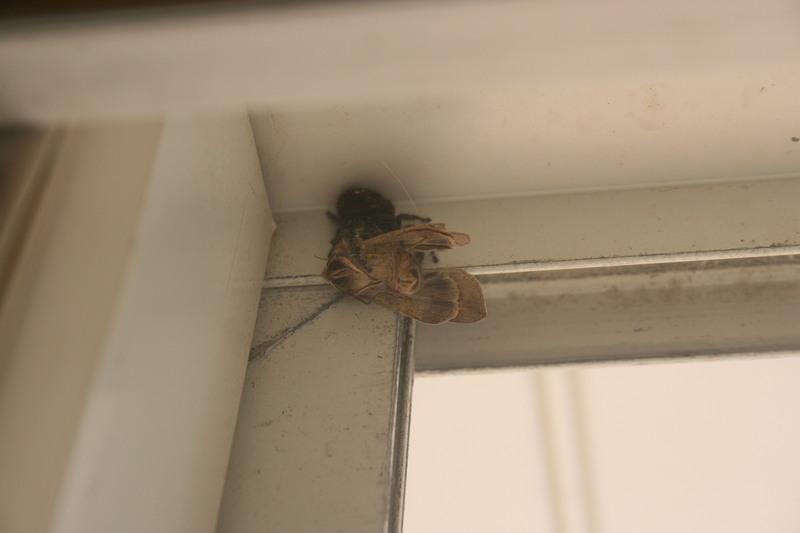 Everyone started freaking out, but I calmly located it – it was hiding in the track of the sliding door. His legs were just barely showing. Anyway, he emerged shortly after & my husband smashed him. Dad was hailed a hero & everyone was mad at me for not killing it earlier, thus putting them all in mortal danger. It was pretty gross, but kinda cool too. Is that bad? I’m glad I made his day!! I am definitely the bravest one in our house when it comes to spiders, but I have to admit, this one was pretty scary – it was big, hairy & super fast. Almost seemed like it could fly (hmmm…maybe it was the wasp in him!!) So, good riddance. 🙂 You just can’t help yourself, can you? I actually wrote an essay about me being an arachnophobe…I’m probably the toughest guy I have ever met, but still afraid of eight-leggers….